Kav and I have returned for our popular series of breaking down Golden and Silver Age comics. 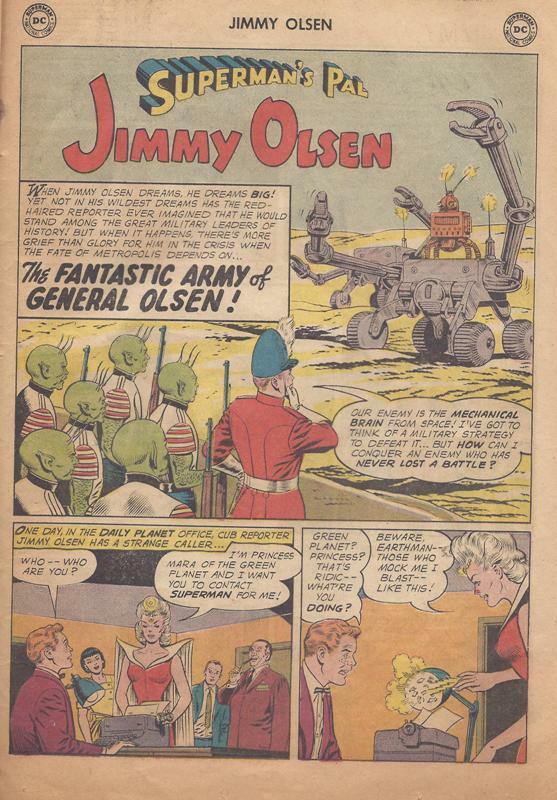 This week, we are going to take on Jimmy Olsen #60 titled 'The Fantastic Army of General Olsen'. Here we go! Kav: OK, it starts off like any normal day at the Daily Planet with some weirdo entering the office. I've noticed that the Planet reporters don't do much work, mainly the stand around staring at whoever this story is about - in this case Jimmy. 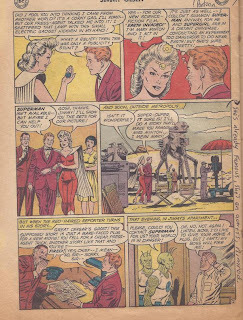 Tony: First of all, it is amazing that there were fifty-nine Jimmy Olsen comic books before this one. 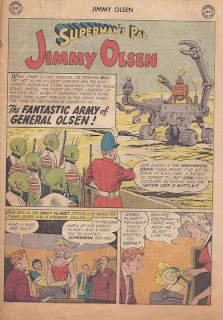 The first panel shows Jimmy, dressed in full Nutcracker regalia, and he is leading some green martian army against a giant Erector Set known as the Mechanical Brain 'from space'. I guess they do not want readers to get the villain mixed up with another Mechanical Brain. How is this piece of junk an undefeated force? Looks like one has to fire the rust cannon and that thing is toast. Judging by the rifles that the martians are armed with, it looks like we know why the Mechanical Brain always wins. 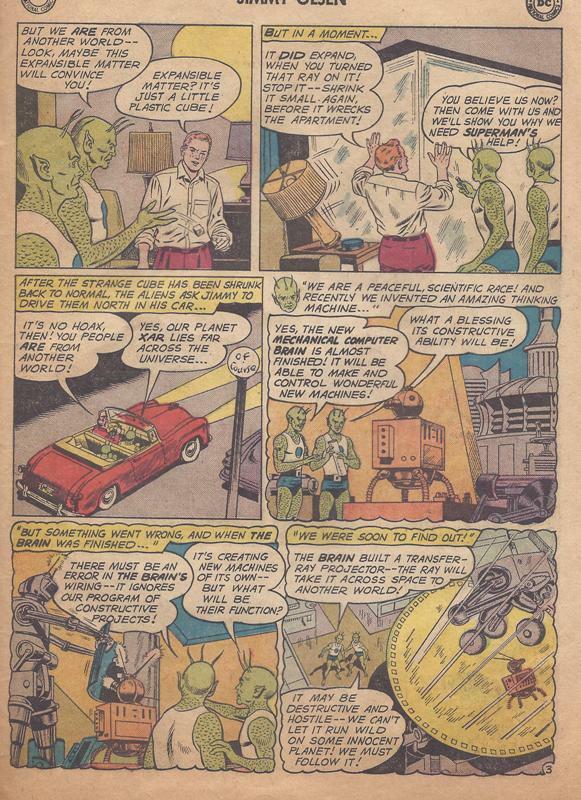 Martians have lasers, but not in this comic book. 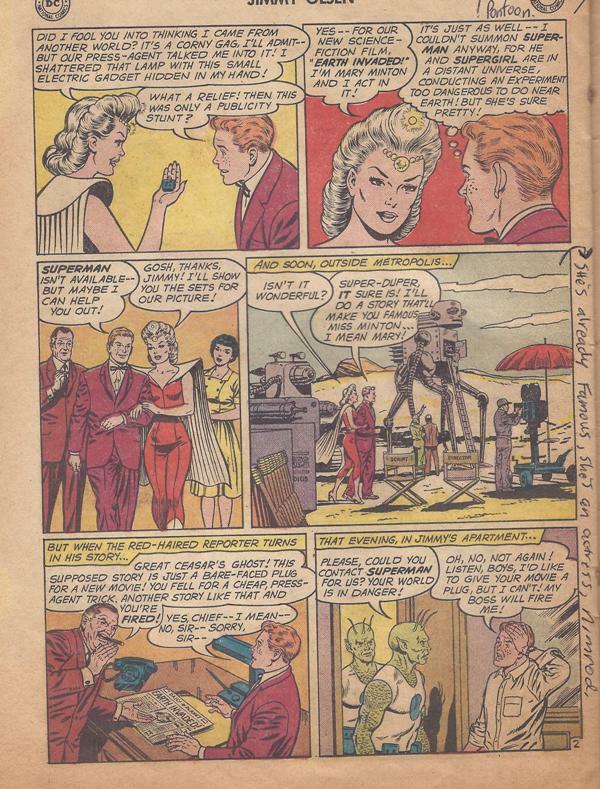 Let's move on to the Daily Planet where Jimmy meets Princess Mara. It's wonderful how she shows off her superior powers by blasting a light bulb. Kav: Jimmy thinks, 'She sure is pretty' - yeah, I guess so, even though her hair looks like a pontoon. Jimmy notes that Superman and Supergirl are away in a 'distant universe'. WTF? A distant solar system, even distant galaxy wasn't far enough away to keep Superman out of this story, no, he has to be in a DISTANT UNIVERSE! Then Jimmy tells the chick that his 'story on her' will make her famous. Hey dumbass, she's an actress and already famous! Also, its interesting how a cub reporter consistently gets his articles printed above the fold. Tony: Earth Invaded is a terrible movie title and it sounds like something that would come from the mind of Michael Bay. *Shiver* There was a time when the media wouldn't plug a movie? Shocking! 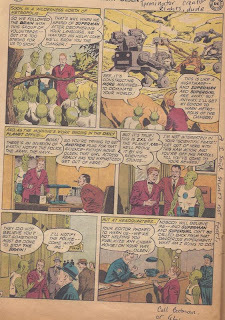 Kav: These aliens are from the planet 'Xar'. Why is every alien planet heavy on the X, Y, and Z letters? Why not planet Eupo or something? Tony: Looks like wife beaters and Speedos are the only fashion choice for males on Xar. What's with the cube? Are we supposed to be impressed that they can take a small cube and make it big? Little Miss Hollywood made a better impression by destroying Jimmy's lamp. If those goofballs can develop the machines then they have the ability to destroy the machines. 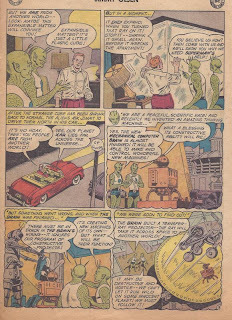 Kav: Ok, Harlan Ellison needs to retract his lawsuit from the Terminator movie where he got cash because he wrote a similar story about robots taking over before Terminator came out, because here we have the basic plot line in a Jimmy Olsen comic from 1962. Then Jimmy tries to warn the police about the invasion, but Perry White has already called the police and warned them not to pay attention to Jimmy. Man they had good communication back then. Also, why in these comics does nobody CALL THE POLICE? They always WALK to the police station to make their complaint. Tony: Why are Olsen and the little green men the only ones paying attention to the Mechanical Brain building other robots? 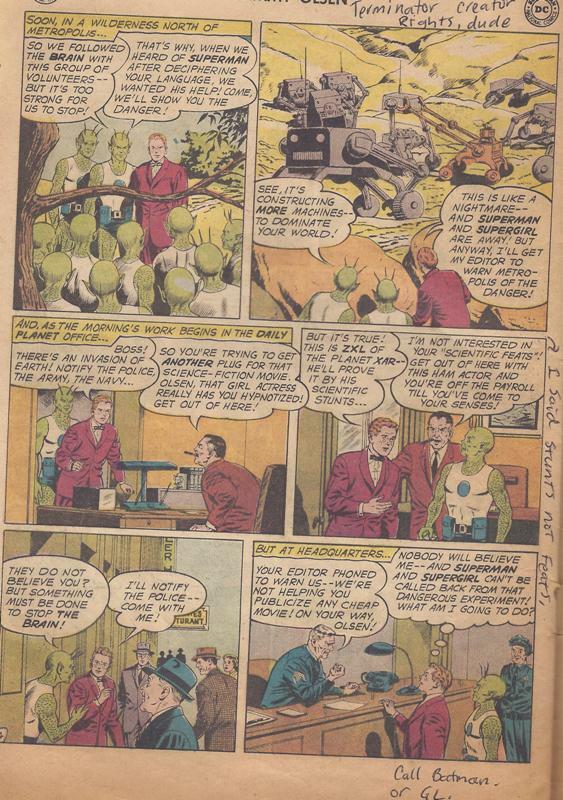 These classic comic books are always filled with giant projects of doom that are witnessed by one or two people. It's great that Olsen demands Perry, not the mayor or governor, to call the police, army, and navy. "You need me to call in the army? I have their number in my Rolodex! Hello, Uncle Sam?" Although we've been reminded twenty times that Superman and Supergirl are far away, Jimmy lacks the brainpower to call Batman, The Flash, Wonder Woman, or Green Lantern. Somehow, this clown leads the little men into battle.